It may be Belli's birthday, but the gifts are for you! Belli's birthday bash will be taking place starting September 8th and ending September 23rd. Belli Skincare is proud to partner with like-minded mom and baby brands to celebrate their birthday and the full pregnancy to motherhood experience with a sitewide sale and online giveaways. 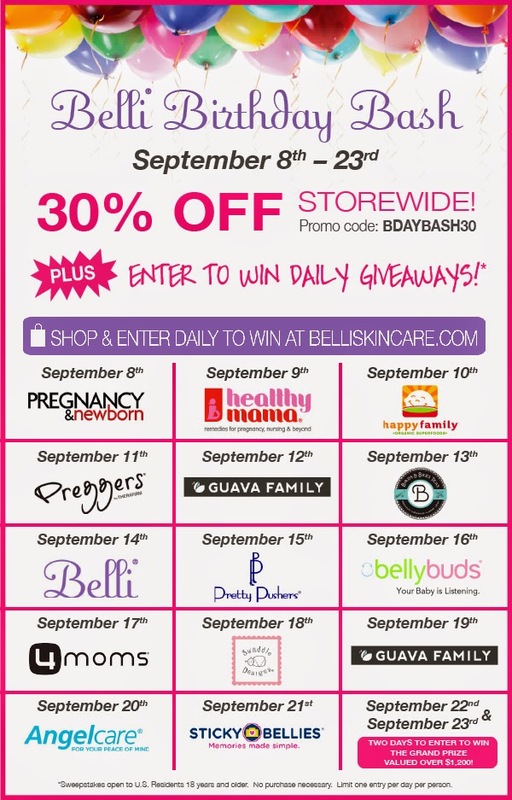 Visit the Belli website to enjoy 30% savings sitewide on Belli Skincare products with promo code (BDAYBASH30). Enter daily to win exciting sponsored product giveaways from prestige mom and baby brands. Participating brands include Healthy Mama, Pretty Pushers, Guava Family, Birds & Bees Teas, Angelcare, Swaddle Designs and Sticky Bellies. Each day a different prize and/or gift certificate will be featured from a variety of brands. On the final two days of the event (September 22nd and 23rd), there will be registration for a Grand Prize Package which features prizes from all of the Belli Birthday Bash event sponsors. One lucky winner will take home the Grand Prize package valued at over $1,200 in mom and baby products.